In the 1930’s the Kelham Fathers built the Great Chapel for their monastery and theological college near Newark-on-Trent in Nottinghamshire. The architect was Charles Clayton Thompson, and to my knowledge he built no other churches. Yet it is one of the most profoundly successful church buildings of the 20th century. It takes to heart many of the insights of the continental Liturgical Movement, and yet is fully provides for the ‘English’ tradition of liturgical celebration. It is contemporary with the ‘back to Baroque’ of the (Anglican) Shrine Church at Walsingham, but has more in common with Eric Gill’s church at Gorleston-on-Sea, which was built around the first central altar in England. My purpose in this post is to suggest that this building, and the liturgy which is shown in the picture above, gives us pointers now that the Ordinariate is soon to have its official Missal. In the 1930’s some Anglo-Catholics sought to show their ‘Catholic loyalty’ by the uncritical adoption of an already old-fashioned Roman liturgical style. Pope Benedict encouraged us rather to search out our native patrimony, and we may now do so without the lurking fear that it is ‘tainted’ with Protestantism. I hope to show that such a native liturgical patrimony is intelligent, fully in line with the General Instruction which guides Ordinariate celebrations, and is beautiful and dignified. Its gravity and simplicity is much in line with the style which I believe the Holy Father Francis wants to see in today’s Church. There will be many today who never knew the Great Chapel at Kelham when is was a place of worship: it was closed in 1972 and is now a large ‘function room’ owned by the local Council. A short description of the building will explain the picture above. The choir which can be seen in the foreground was square in plan, about sixty feet in either direction. The walls were of unadorned brown brick, and the floor of black polished tiling. The dark oak stalls provided seating for 150 students (who can be seen wearing the distinctive and very practical blue cotton scapulars) with returned stalls for the priests and lay-brothers of the Community. At the west end was a narthex and gallery above for lay visitors. At the east end of the choir was a dramatic brick arch (the underside can just be seen) on top of which was the Rood (crucifix) with attendant figures of Mary and John, sculpted in bronze by Sargent Jagger. The sanctuary was paved in green stone, with the same stone being used for the high altar and credence. The altar stood well forward of the apse wall which was finished in a rough grey render. Superb acoustics were ensured by the saucer dome over the choir, and much of the Mass and Office were rendered in English to plainchant, accompanied on the small pipe organ raised in a gallery on the north side. In the picture High Mass is being celebrated for one of the ‘Green Sundays’ – after the Epiphany or Trinity – what we now call Ordinary Time. The Celebrant has turned to greet the people, perhaps ‘The Lord be with you’ before the Collect. The deacon and subdeacon have moved apart so that there is no barrier between celebrant and people. The ministers are assisted by servers – crucifer and acolytes, thurifer and boat-bearer. All of them wear the alb, full length to the floor, caught at the waist with the girdle. Their amices have a coloured collar attached to them, known as the ‘apparel’ which smartens the neck-line and hides the alb fastening. The acolytes have placed their candlesticks in front of the altar and are standing by them. The altar itself is very long and raised on three shallow steps. Because of the great width of the sanctuary it is possible to ‘return’ the steps: in most parish churches the steps, except for the footpace or predella, go right across the sanctuary. The arrangement of the steps and the generous space behind the altar would allow in these modern days for the celebrant to adopt either the ‘eastward’ or ‘facing the people’ position for the Eucharistic Prayer. The altar cross is of silver, and bears an enamel plaque of Christ in majesty (because the rood shows the suffering Christ) and is matched by a pair of very solid candlesticks. The short candles are quite deliberate, for the proportions of the altar are horizontal, not vertical. Although the sanctuary is very large, the altar is still dominant and is not overpowered by too many, or too tall, altar ornaments. Further candles are provided by the dark oak standards on the pavement, and three silver lamps hang above, (Always known as the ‘bombs’). The altar has no frontal: this is a break with English tradition in which the altar is always vested – though a frontal was used for festivals. It is worth pointing out that there is no tabernacle on the altar or indeed, within the sanctuary. The Blessed Sacrament was reserved in a side chapel, and although this probably reflected Anglican nervousness about Reservation, it was in accord with the then current Roman regulations for Cathedrals and churches where the Office was sung in choir. It seems unlikely that celebrations of the Mass on such a scale will be possible in the Ordinariate, at least for the time being. And where the Groups are celebrating in their local Catholic Parish church, then the alterations of the 70’s and 80’s will probably make anything resembling the above liturgy difficult! 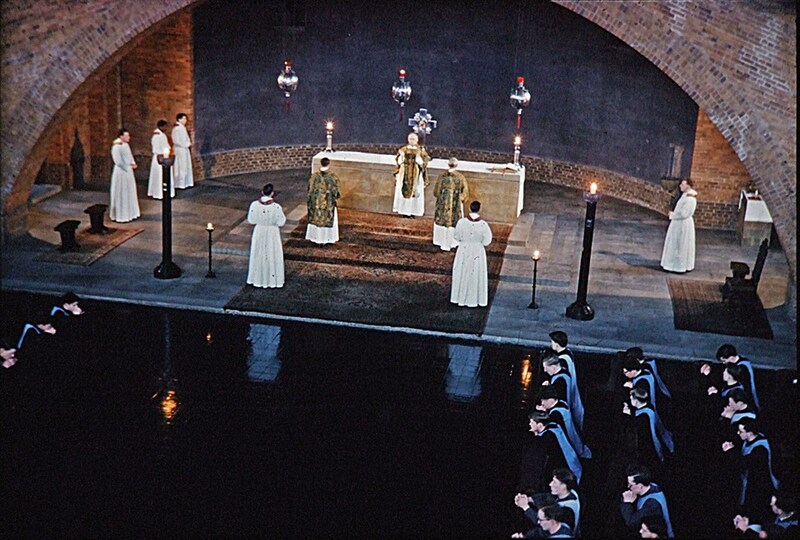 But the lessons of proportion, dignity and unfussiness of vesture, grace of movement, and audibility (there was no sound system in the Great Chapel) might well be a small contribution to the renewal and growth of worship among Catholics generally and an attractive feature of the Ordinariate liturgy. This entry was posted in Uncategorized and tagged Catholic Church, Charles Clayton Thompson, Kelham Fathers, Liturgical Movement, Ordinariate, Pope Benedict. Bookmark the permalink. A beautiful description of Kelham! I go there with my Wife occasionally. The peaceful grandeur of the building always amazes me. The graveyard for members of the Society of the Sacred Mission is, perhaps, one of the most peaceful and simply beautil places I have been to. I visited a friend, the late Fr Donald Percy, who was studying at Kelham in the late sixties, and was permitted to sit in Choir for the Office. I still remember the palpable silences at the divisions of psalm verses as we paused before completing the line. It was magical. At Compline when lights were dim, the floor tiles created the impression that one was in the midst of a glittering black sea, across which the voices rolled back and forth. It would have been impossible then, to imagine how sudden, and how complete, the destruction was to be. It is still a source of grief to me. Might I commend a viewing or visit to the transformed Community church at Mirfield in an ecumenical spirit of your Anglican patrimony of course. In Xto. Paul A Newman.